A troubled teen forms a bond with a broken down racehorse. Most good British filmmakers, at some point in their careers, find themselves seduced by the lure of the wide literal and allegorical vistas offered by filming an American story. Many have given us movies more quintessentially American than those made by many American filmmakers, as sometimes it takes a neutral observer to get to the root of a nation's fabric. For successful recent examples see Andrea Arnold's American Honey and David Mackenzie's Hell or High Water. 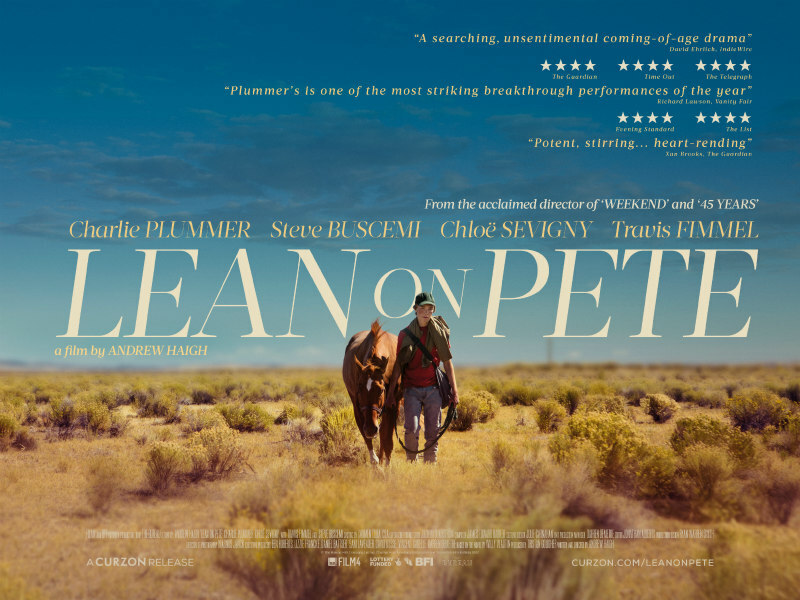 Less successful is Lean on Pete, the American debut (if you discount his TV show Looking) of director Andrew Haigh (Weekend; 45 Years). Rising star Charlie Plummer (King Jack; All the Money in the World) is 15-year-old Charley Thompson, newly arrived in Oregon with his wayfaring father Ray (Travis Fimmell), who never has money for food but always has money for beer. One day Charley finds himself idling about a nearby stables, where he is roped into helping struggling racehorse owner Del (Steve Buscemi) to change a tyre on his pickup truck. Impressed by Charley's gumption, he takes the boy on as his poorly paid assistant, and the two travel to races along with cynical female jockey Bonnie (Chloë Sevigny). Charley becomes attached to Lean on Pete, one of Del's horses who has seen better days, and thanks to some training from Charley, the horse wins a couple of races. This doesn't stop Del from deciding to cash in and sell the nag off to a Mexican glue factory. Determined to save his equine buddy, Charley steals Pete and sets off on a cross country journey in search of his Aunt Ruby, the only family member who ever showed him real affection in his life. 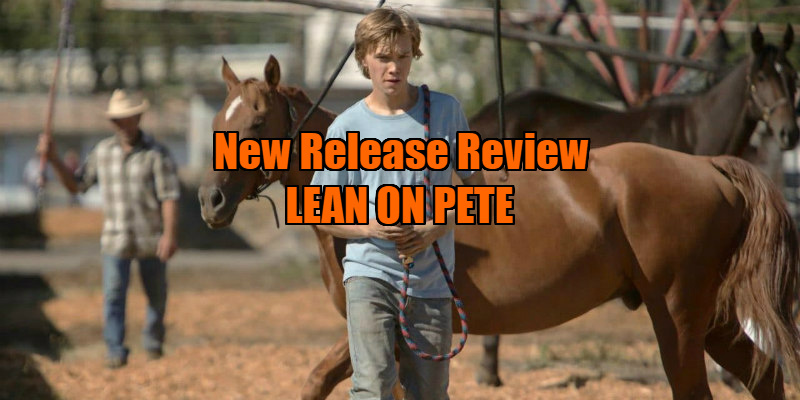 Lean on Pete is very much a movie of two halves, one populated with engaging and intriguing characters, the other with a succession of crudely drawn, white trash stereotypes. The first half is an endearing workplace drama, as Charley finds a kinship among his grumpy, world weary seniors, Del and Bonnie. His youthful enthusiasm even seems to be rubbing off on the pair, who become sort of reluctant paternal and maternal figures for the teen. Buscemi is especially great in his best role in quite some time, and his Del is the sort of character I could picture Warren Oates playing in the sort of '70s American road movies that Lean on Pete appears to take as inspiration in its early scenes. Once Charley hits the road with his stolen stallion the movie becomes a lot less interesting and ventures into clichéd territory. It begins to feel very much like the work of an outsider filmmaker, one whose experience of America is formed more by that country's literature than any first hand experience. Charley's quest to track down his aunt is broken into a series of Salinger-esque vignettes in which he experiences the American working class at their worst and most stereotypical, a basket of deplorables as poorly rendered as end of level bosses in some '80s sideways scrolling arcade game, not so much real people as obstacles for our hero to overcome. Haigh's film has been compared to Chloe Zhao's The Rider, but aside from featuring young men bonding with horses, the two films don't share much in common. Zhao's film has a genuine affection for its rural working class milieu and the people who populate it, while Haigh's simply sees this world as something to escape for a life in the suburbs. Lean on Pete's young protagonist comes from the same world as the people who get in his way, but despite Plummer's endearing presence, I never quite bought the fresh faced actor as someone from such a rough and tumble background. The film seems to believe Charley is somehow different, somehow deserving of better than those others stuck in his environment, and the authority figures he encounters improbably view him as a victim of circumstance rather than a criminal. Perhaps in reinforcing the idea that a working class existence is something a chosen few can escape from, Haigh has made a very American movie indeed. Lean on Pete is in UK/ROI cinemas May 4th.